In 2017, the Tett Centre partnered with Waterlution for Great Art for Great Lakes (GAGL). This initiative involved community participation projects in eight different cities, each focusing on ideas that highlight the grandeur of the Great Lakes and its connection to its people, their history, and diverse cultures. Through a series of public workshops or actions, each community worked towards the co-creation of a permanent artwork as part of celebrating Canada’s 150th birthday. We are very proud to be home for Aqua Viva, the GAGL community art project coordinated by Kingston’s chosen lead artist, sculptor Andy Berg with local participants. Aqua Viva began as a community engagement process to discover, celebrate and foster Kingston’s special relationship to the waters of our own Great Lake, Lake Ontario. Through Berg's artistic process, she led participants along the lakeshore, appreciating the lake environment with many senses. Thus inspired, she then guided visualization and facilitated text and clay-medium maker-workshops. As a completed project, Aqua Viva is a low-relief, glazed and fired polychromatic stoneware wall work which articulates shared community values, hopes and relationships to the gift of our special Great Lake environment. 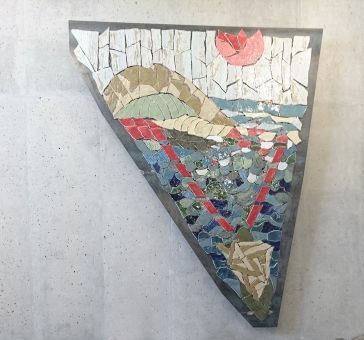 This beautiful piece, located in the Tett Centre’s main stairwell, incorporates community text and symbols, lake environment elements, and an ecological narrative that revitalizes a Canadian icon and local Lake Ontario inhabitant, namely: Amik, Tsyennì:to, le Castor, Beaver. For more information, please visit the Great Art for Great Lakes link here!